Email askfuiping@gmail.com if you are looking for a safe solution for your thyroid problems. 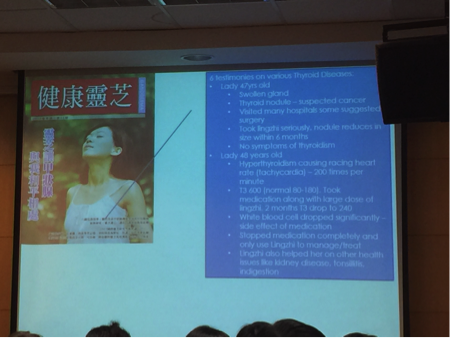 Many research have shown that Lingzhi / Ganoderma can be used to treat thyroidism conditions. 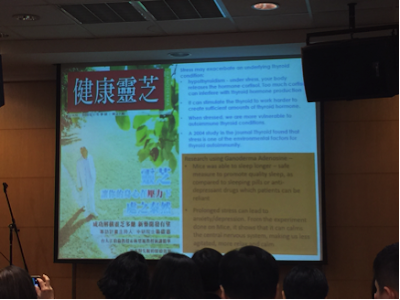 An article published by Prof Lin Zhi-Bin (a well-known expert on Lingzhi) states that Lingzhi is effective in treating Grave's Disease along with methimazole medication. It is able to reduce the side effects of methimazole on liver and white blood cells. The Ganoderma Magazine published in January 2005 (Issue 27) states that stress may exacerbate an underlying thyroid issue. For people with hyperthyroidism, when they are under stress, their body releases a hormone called cortisol. Too much cortisol can interfere with thyroid hormone production. It stimulates the thyroid to work harder to create sufficient amount of thyroid hormones. So in that sense, stress makes us more vulnerable to autoimmune thyroid conditions. In a 2004 study in the journal Thyroid, it was found that stress is one of the environmental factors of thyroid autoimmunity. How do we manage our stress? Some people practice yoga or meditation, as well as take Lingzhi. Research shows that Ganoderma Adenosine is actually a nucleotide of G. Lucidum. Mice can sleep longer and better. Mice do not become dependent on Lingzhi to sleep better, unlike sleeping pills, where patients can become reliant on these drugs to help them sleep. Lingzhi is a natural anti-depressant / sleeping pills. Prolonged stress can also lead to anxiety / depression in the case of hypothyroidism. From experiments on mice, it shows that Lingzhi can calm the central nervous system, making us less agitated, more relaxed and calm. Ms Z's friend has hyperthyroidism, with symptoms that include very bad hand tremors, shortness of breathe and rapid heartbeat. The doctor didn't prescribe any medication to her and advised that she go back 3 months later to check again. During this time, her condition deteriorated and the symptoms became more aggressive. She started with 4 capsules Jia Hor Lingzhi a day and doubled up to 8 capsules Jia Hor Lingzhi subsequently. Vertigo reactions: Heartbeat increased substantially for a period, but she recovered after that. Ms Z's friend, who's an ex-teacher, was diagnosed with this condition when she retired. She also has vertiligo (white patches on skin). As she also has other health issues, she consumed 2 capsules Yung Kien Ganoderma2 + 8 capsules Yung Kien Ganoderma daily. Within 1 month, her T3 and T4 readings were excellent. Ms Z noticed her hand has tremors and she has rapid heartbeat. From a medical checkup, she found out she's suffering from hyperthyroidism. The doctor prescribed her with carbimazole (same family as methimazole). The side effects include a reduction in white blood cells. She sought a second opinion from an endocrinologist. From the blood test, it's confirmed she has Grave's Disease, a form of autoimmune disease which attacks her thyroid hormones. The doctor also prescribed with the same medication. Instead, she decided to take 1 capsule Yung Kien Ganoderma2 + 6-8 capsules Yung Kien Ganoderma + Yung Kien Pollen a day. After 3-4 months, she doesn't feel any more symptoms relating to hyperthyroidism. She feels Lingzhi has helped her. A 47 year old lady has swollen glands and was diagnosed with thyroid nodule (abnormal growth that form a lump in the thyroid gland). She visited many hospitals. Some doctors suspected it could be cancer and recommended thyroidectomy surgery. Over the 6 months, she looked for alternatives and other ways to help her. During this time, she was also recommended to take Lingzhi. She decided to take Lingzhi very seriously, at a high dose. The size of the nodule reduced within 6 months. She had no more symptoms of hyperthyroidism. A 48 year old lady suffered from hyperthyroidism. Symptoms include racing heartbeat, which is a condition called tachycardia where the heart beats 200 times/minute. She was born with a polio condition and has been taking Lingzhi for her other health conditions. When she was 48 years old, she was diagnosed with hyperthyroidism. She almost fainted one day when her heart beat so quickly. There was nobody at home. She finished 1 whole bottle of Lingzhi within 2 hours. She felt ok after that. Her T3 reading was 600 ng/dL (normal 80-180). She took medication together with Lingzhi. After 2 months, her T3 reading dropped to 240. But because of the side effects of the medication, her white blood cells count dropped significantly. Under the advice of her friend, she stopped medication completely and only continued with high dose of Lingzhi to manage/treat her issue. She felt completely fine. Lingzhi has also helped her treat her other health issues, including kidney disease, tonsillitis and indigestion issues.